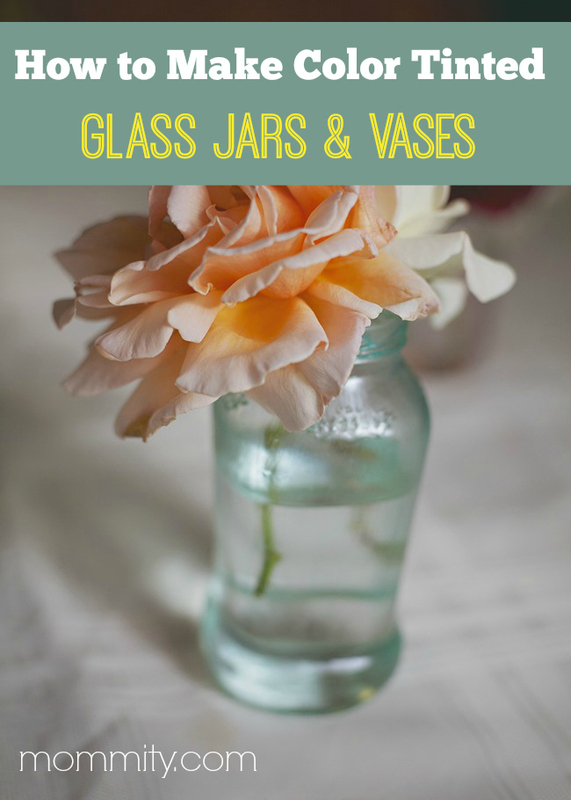 How to Make Color Tinted Glass Jars – Vases, Decorative & More! My mother can’t throw away glass jars. So there is a whole shelf in our cup cabinet dedicated to empty jars. It may sound silly but they really have come in handy to have around. For instance, when storing left over soup it takes up much less space in the fridge and is easy to pour. But yesterday while staring at this full shelf of different shaped jars I thought it would be fun to color them. 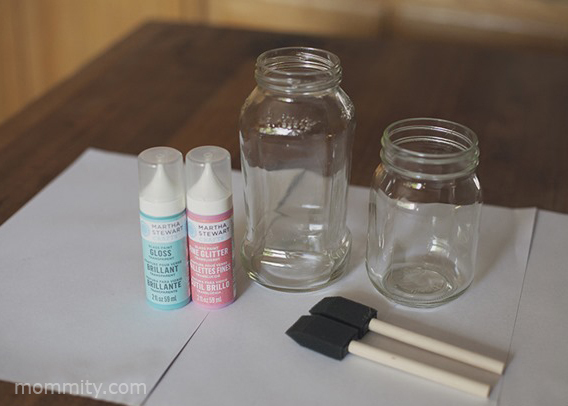 I was thinking of using regular acrylic paint but that would only make them decorative, not necessarily useful for food storage and certainly not easy to wash. A quick internet search came up with several brands of glass paint so I headed to my local craft store. While trying to browse through the many rows of colors and types of glass paint (while two children are NOT behaving) I grabbed the Martha Stewart glass paints in Fine Glitter Translucent “Candy Apple” and Gloss Transparent “Bright Sky”. I really have no clue what I’m doing because the bottle provides very little in the way of directions so I’m going to wing it. How hard can it be? Glass jar, vase, wine glass, etc. Glass Paint – I used a Fine Glitter Translucent and Gloss Transparent by Martha Stewart. I covered my surface in paper and got to painting. I’m sure you can use a regular paint brush but I used a sponge brush because I have a whole bag of them already. It really was very simple. I just painted in long brush strokes trying to keep the coverage even. At first they didn’t seem to be showing any color but as it dried the color came through more. With the glitter I got fancy and tried to give the jar an ombre effect with the color heavier at the bottom and lighter toward the top. The back of the paint bottle led me to a website with instructions on curing and using your painted piece. 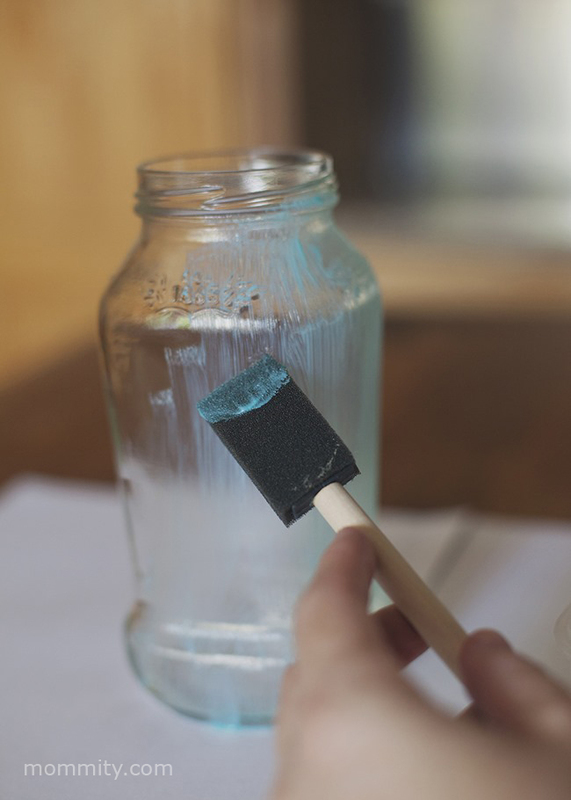 For the Gloss Transparent paint you can cure it by letting the jar air dry for an hour, then follow their directions for curing it in the oven, then waiting 72 hours before using. Rather than waiting 21 days for it to cure by air drying. Ain’t nobody got time for that! Unfortunately with the Fine Glitter Translucent paint, there is no wait to oven cure it and it has to sit out for 21 days before you can wash it. But once it’s cured it’s safe to wash in the top rack of your dishwasher. I thought these came out really cute and plan to use them as vases to brighten up our kitchen table this spring. After doing it once, I learned from some mistakes. Don’t let any thick globs build up anywhere or it will stay that way. Also, the brush strokes stay and the glass will now be textured, but I didn’t mind that. And the glitter did come out very transparent so for more color I should have layered it on top of the gloss of a similar shade. As I was making these, the ideas just kept coming. Wouldn’t painted vases be adorable as wedding or baby shower centerpieces? Or to give as gifts with homemade candy inside? Glitter painted champagne or wine glasses could make a really elegant wedding gift with your personal touch. Dollar store plain votive candle holders would look so pretty painted in a glitter or color to match a holiday or your house decor. How cute would a painted cake stand be!! The possibilities are endless, especially if you get some painters tape involved for stripes or cool geometric designs. Next up…the Frost Translucent paint. I think my friends know what they are getting for Christmas this year. Revealing of Our Master Bathroom Update!